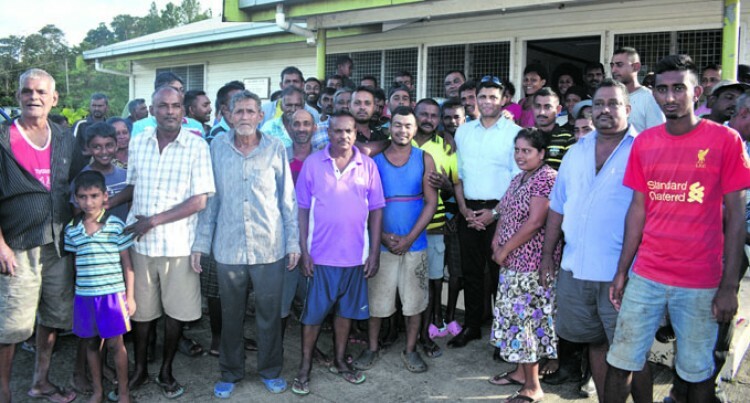 Attorney-General Aiyaz Sayed-Khaiyum with the farming community of Loma in Sigatoka Valley on April 12,2018. Photo: Waisea Nasokia. Close to 90 per cent of crops and vegetables in the Sigatoka Valley have been damaged as a result of Tropical Cyclone Josie and TC Keni. Attorney-General Aiyaz Sayed-Khaiyum yesterday visited areas affected by flooding. The A-G visited four farming communities at Bila, Bilalevu, Tavuto and Loma/Navula along the Sigatoka River. He said close to 500 farmers had been affected in the Sigatoka Valley, an area which contributed significantly to Fijian vegetable exports. Mr Sayed-Khaiyum took time to meet farmers who lost most of their crops. He said, “it’s apparent that the majority of the farms along the river- side have been affected. It would appear from what the farmers have told us that at least they have lost 90 per cent of their crops either directly as a result of the flood or the wind itself or as a consequence of water clogging their farms which means the crops will rot. “They have also raised issues about not getting immediate support from the Ministry of Agriculture which will get addressed. “This will have a huge impact on our vegetable production from the valley because if there is going to be a shortage of these vegetables then it will lead to price increases. “It will have an impact on our export capacity because most of these farmers export to Australia and New Zealand. It will fundamentally affect the livelihood of these people because they are solely dependent on earning from their farms. “They either sell to the local middlemen or they sell directly at the markets. They also supply locally to the hotels. Yesterday his team distributed food rations, but there will be other initiatives that will be announced by the Prime Minister soon. The A-G is expected to visit other flood-affected areas in the greater Sigatoka Valley area in the coming days. The cyclones and floods, the A-G said, would have a huge impact on the farmers and their families’ livelihoods, agricultural production, our exports and the economy as a whole. The A-G assured the farmers of the Government’s continued support and assistance after the damaging effects of Tropical Cyclone Josie and Keni in the past week.